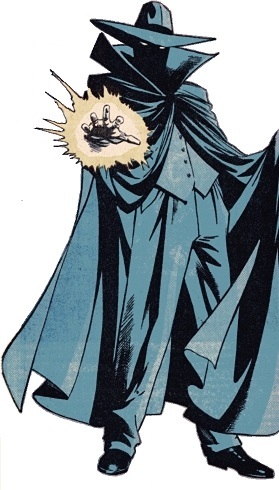 Powers/Abilities: Due to his exposure to and experimentation with T-rays, Death-Stalker existed in an interdimensional realm so close to Earth that he could observe and hear events on Earth, though he could not be detected from Earth by conventional sources. By will he could shift into the Earth dimension to varying degrees, becoming visible but intangible, visible and tangible, or invisible and intangible; he could instantly shift by mental control, and he could disappear from Earth's dimension altogether. Those passing through his intangible form sometimes felt a freezing cold within him, and were sometimes afflicted with intense fear. He could not remain on Earth for more than several hours at a time. Spatial relationships may have varied in his interdimensional realm as he could cover distances more quickly in that realm, allowing him to emerge at two distant locations in a short time period. Death-Stalker could see the astral form of Dr. Strange. His skin was turned chalk-white in the T-ray explosion. Sterling was a gifted inventor, a brilliant criminal mastermind, and an accomplished scientist, with extensive knowledge of advanced scientific equipment. Death-Stalker wore cybernetic gloves that allowed him to kill those he touches, his "cybernetic death grip," via mental command, which flooded a target with a level of microwaves that was instantly fatal. He had to be fully in phase with the Earth dimension in order to use the glove's death touch, which made him susceptible to physical injury at the same time. While this touch generally worked almost instantly on contact, occasionally victims were only stunned after brief contact, perhaps due to only glancing or tangential contact, or other factors; possibly Death-Stalker sometimes used less lethal force for his own reasons. His first contact with Daredevil allowed several seconds of solid contact, which weakened, but did not kill the hero. It is also possible that his touch was less effective initially and that he amplified its strength over time. Despite the microwave effect, those surviving the death touch described its feel as a chilling cold, as if one's blood was freezing. Perhaps his less lethal attack was another effect entirely, draining the energy or warmth from a victim. In several cases, Death-Stalker demonstrated apparently superhuman strength. It is unclear whether this was a physical ability, via his radiation mutated form, or via cybernetics or other means. Death-Stalker briefly used a spray that caused maddening hallucinations. He briefly wielded a deadly proton converter as a weapon; this could release devastating energy blasts that could even penetrate (given time) Dr. Strange's mystic shields. Coupled with a spatial disruptor, it was intended to be even more powerful. As the Exterminator, Sterling wielded the "time displacer ray" or T-ray gun, which he also invented. It fired an energy blast that banished a person for a time to a limbo-like interdimensional void lying close to normal reality; he claimed (and likely believed) that the ray banished targets into "another time continuum." He could control the period of time for which others were banished, often only 30 minutes, but sometimes for days; an intense amount of "displacement" radiation ("T-radiation") could banish victims permanently. By adjusting the T-gun's settings, it could be used to project destructive force, shattering a bank vault with ease. The Exterminator also used other forms of advanced equipment, such as a magnetized metal disc able to attract various forms of matter, including human tissue; it could prevent a person standing on it from stepping off of it. (Daredevil I#208 (fb) - BTS) - The Sterling name was one of the first on the North American continent, and the Sterling family developed extraordinary wealth. (Daredevil I#208 (fb) - BTS) - Elizabeth Dawes Sterling dearly loved her only son, Philip Wallace Sterling, despite him becoming a super-villain. (Official Handbook of the Marvel Universe I#13) - It is unrevealed why Sterling initially turned to crime. (Daredevil I#10-11 - BTS / Daredevil I#40 (fb) - BTS / Official Handbook of the Marvel Universe A to Z Vol. 8: Organizer entry) - Sterling was employed as a scientist by the Organizer (Abner Jonas). (Daredevil I#40 (fb) - BTS) - Sterling left town before Jonas' trial; as Sterling apparently had nothing to do with the case, nobody bothered to look for him and he was soon forgotten. (Daredevil I#39 (fb) - BTS) - Sterling designed deadly technology that allowed him to displace others to an interdimensonal limbo-like realm with his T-ray gun, powered by a cylinder of "special formula T-gas." Sterling believed the T-ray actually displaced its victims into another time continuum. (Daredevil I#39 (fb) - BTS) - He recruited Ape-Man, Bird-Man, and Cat-Man, former members of the Organizer's Organization. Naming them the Unholy Three. They engaged in a crime spree under his leadership. (Daredevil I#39) - While the Unholy Three committed a robbery, Daredevil attacked the three, managing to repel them and deliver several blows while only being hit a few times himself. The Exterminator was furious with the three of them for their failure. 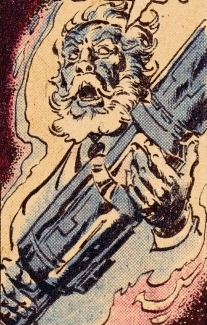 He then demonstrated his dangerous T-ray gun on Ape-Man, who disappeared for a half hour. 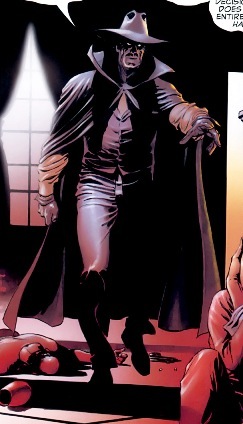 After receiving information on the location of Debbie Harris and Foggy Nelson from a night club patron, the Exterminator then sent the Unholy Three to use the device on Debbie Harris, both enabling the Unholy Three to get their revenge on the girl who helped Daredevil send them to prison, and for Exterminator to have clout against potential district attorney Franklin “Foggy” Nelson. Arming each of the Unholy Three with a portable T-ray gun, the Exterminator personally drove the them to the night club, warning them that -- in case they got any wild ideas -- while they each had a weapon, only he possessed the master control, without which their weapons would be useless. Within the night club, the Three used the device on the doorman and a patron as well as Harris, causing the crowd to flee, thinking the victims to have been disintegrated. (Daredevil I#40 - BTS) - The Unholy Three continued their crime spree, hitting Daredevil and others with the T-ray. Foggy reasoned that whoever was leading the Unholy Three now might have been connected with them in the past. Searching articles about the capture of the Organizer's gang, he found that there was a scientist working for Jonas who left town before the trial; as he apparently had nothing to do with the case, nobody bothered to look for him and he was soon forgotten. Meanwhile, many of the Exterminator's victims (including Debbie Harris) had been pulled back to Earth from the interdimensional void, but they still remained a fraction out of sync with the Earth dimension and those could not be sensed, or directly interact with anything. (Daredevil I#41) - Notifying the newspapers and radio and TV programs that he knew the Exterminator's secret identity (but not saying what it was), Foggy wandered Central Park, hoping the Unholy Three would confront him there; carrying a police whistle, he planned to summon the cops as soon as he saw them, but they ambushed him, knocking the whistle away from him and knocking him out. They then brought Foggy back to the Exterminator. The Exterminator, sensed this discrepancy in his T-gun, but then decided that this merely made his weapon all the more dangerous if people were permanently banished. The Exterminator planned to test the fullest setting on Nelson, banishing him forever, but Daredevil attacked and swiftly defeated the Unholy Three. The Exterminator fired on Daredevil, who dodged and knocked out the Exterminator with a single kick. Intending to fake his own death (to end his triple identity woes (Matt Murdock, Daredevil, and Mike Murdock, the alleged alter ego of Daredevil), Daredevil then overloaded the Exterminator's mechanism, causing an explosion that destroyed the time displacement equipment. Both Nelson and the Unholy Three survived, the T-ray's victims returned, and Daredevil was briefly believed dead when Foggy found fragments of his costume. (Daredevil I#158 (fb) - BTS / Official Handbook of the Marvel Universe I#13: Death-Stalker) - The explosion irradiated Sterling with an extraordinary amount of the displacement energy, leaving him in an interdimensional realm (presumably the same one to which he had previously banished others) so close to Earth that he could see into, though he could not be detected from Earth by conventional sources. The radiation also turned Sterling's skin chalk-white. Sterling eventually learned that he could rematerialize back on Earth and then return to the realm simply by willing himself to do so. However, he found he could not remain on Earth for more than several hours at a time, as as the T-radiation inevitably drew him back into the interdimensional realm. (Official Handbook of the Marvel Universe I#13: Death-Stalker) - Seeking the means to be able to return to Earth permanently and recognizing his ability's potential for crime, Sterling adopted the new alias and costume of Death-Stalker. (Daredevil I#158 (fb) - BTS / Official Handbook of the Marvel Universe I#13: Death-Stalker) - Sterling stole blueprints for a cybernetic death-grip from AIM (Advanced Idea Mechanics) and created an electronic link from his gloves to this mechanism, allowing him to kill with a touch. 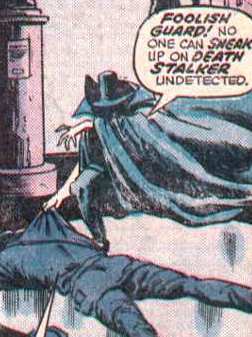 (Official Handbook of the Marvel Universe I#13: Death-Stalker) - Death-Stalker embarked on a career of stealing secret inventions, documents, etc. from supposedly inaccessible places. (Daredevil I#158 (fb) - BTS / Official Handbook of the Marvel Universe I#13: Death-Stalker) - Death-Stalker also attempted to obtain the materials to rebuild a T-ray machine that could enable him to remain on Earth as long as he wanted. (Iron Man I#116 - BTS) - In battle with Iron Man (Tony Stark), the original Unholy Three were killed, infuriating Death-Stalker. (Daredevil I#115 (fb) - BTS) - Despite the disappearance of Ted Sallis (who had been turned into the Man-Thing), the Sallis Papers containing information on Operation: Sulfur, whose solution SO-2 could turn men into pollution-breathing swamp monsters, were preserved. Sallis' notes indicated that the pollution-breathers might also be immune to most forms of bacteriological warfare. Members of the US government and/or military continued to research this, intending to form an army immune to germ warfare, which they might use against their enemies. (Daredevil I#115 (fb) - BTS) - Death-Stalker sought the Sallis papers, apparently seeking to sell their secrets to the highest bidder. (Daredevil I#113 (fb) - BTS) - Seeking the secrets of the Sallis Papers, Death-Stalker forced Gladiator (Melvin Potter) to work for him, promising to kill him otherwise. (Daredevil I#113 - BTS) - Gladiator kidnapped Foggy's sister, Candace Nelson, who'd stolen the Papers, and returned her to Sallis' last residence in the Florida Everglades, where Death-Stalker kept her captive. (Daredevil I#113) - When Daredevil and Richard Rory arrived, Gladiator attacked as Man-Thing approached. 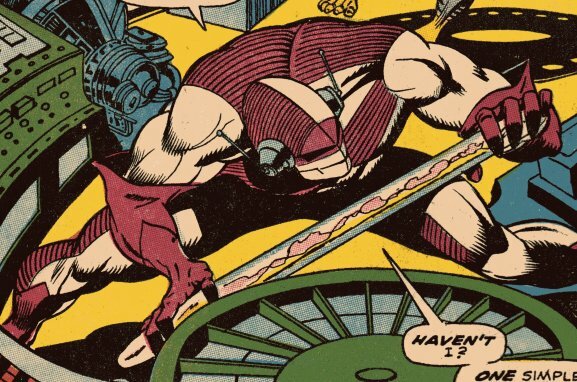 When Daredevil was knocked unconscious, Death-Stalker appeared, instructing Gladiator to kill him. (Daredevil I#114) - Man-Thing interrupted the fight, burning Gladiator's arm; having suspected the Man-Thing to be a product of the formula he was seeking, Death-Stalker chose to observe him initially. Only after Gladiator was defeated and the Man-Thing turned towards him did Death-Stalker touch Man-Thing, instantly incapacitating him. Daredevil swung at Death-Stalker, but passed through his intangible form, feeling an intense cold that seemed to freeze his hand, after which Daredevil was nearly overwhelmed with intense fear. After Daredevil tried futilely to avoid and/or injure Death-Stalker, the villain grabbed Daredevil's shoulder, releasing seconds later when the hero was unconscious. When Gladiator complained that Death-Stalker could have stopped Man-Thing sooner, Death-Stalker reminded him who was in control and cowed him by threatening to touch him. Hinting that he had chosen not to kill Daredevil, Death-Stalker picked him up and carried him back to Sallis' old shack, and had Gladiator pick up Richard Rory and bring him as well. After Candace told him Daredevil and Rory didn't know anything about the Sallis Paper, Death-Stalker took Candace and ordered Gladiator to burn down Sallis' shack with Daredevil and Rory in it. As Gladiator rushed off, he was subdued by the revived Man-Thing, while Daredevil revived in time to get himself and Rory to safety. Meanwhile, Death-Stalker traveled to New York City, taking Foggy Nelson hostage alongside the captive Candace. When Matt Murdock called in to talk to Foggy, Death-Stalker coerced him to tell him that there was no news on Candace or the kidnappers. Foggy also told Murdock he and Daredevil should return to New York and that they shouldn't discuss things over the phone as there was no telling who might be listening it (Foggy was trying to tip Murdock off that Death-Stalker was with him). Recognizing that Foggy would have had no way of knowing Daredevil was in Florida with him, Murdock realized Death-Stalker was with him. Death-Stalker announced his plans to kill all who knew the secret of the Sallis Papers. (Daredevil I#115) - When Daredevil attacked, Death-Stalker was surprised but nonetheless turned immaterial and easily escaped. When Daredevil pursued him, Death-Stalker caught him again with his "death touch," but again delivered only a limited dose, and he released Daredevil before killing him when a policeman interrupted them. Via his billy club, Daredevil stopped Death-Stalker from killing the cop; Death-Stalkerr vanished again, reappearing ten floors above Daredevil and mocking him before vanishing again. Death-Stalker hired the chemist Milo and brought him to a closed down Osborn Chemicals plant to try and recreate the formula in the papers. When Daredevil attacked, Milo opened fire before being subdued. Daredevil realized Death-Stalker couldn't use his death-touch and phase at the same time as Death-Stalker tried knocking the hero into a vat of hydrochloric acid. They fought across the plant until Death-Stalker fell into the vat and was seemingly killed. He presumably turned intangible and/or returned to his interdimensional realm, then gave up after Daredevil destroyed the papers he needed. Daredevil destroyed the Sallis Papers (throwing them into the acid) and apprehended Milo. (Daredevil I#128) - Seeking to rebuild an ancient lens ray designed by the ancient Atlantean wizard C'Thunda (designed as part of a weapon great enough to destroy Atlantis), Death-Stalker sneaked into Manhattan's Natural History museum to acquire a pair of mirrors from Egyptian and Roman wings, killing one guard, Jackson, and knocking out another in the process. He then traveled to the Museum of Modern Art, locating the mirror he sought from amongst a series of ordinary mirrors in an abstract art exhibit. To obtain the final piece he needed he sneaked into the science pavilion at Flushing Park (site of the 1964-1965 World's Fair). As he finished the ray, Daredevil (drawn there by an energy discharge released by the Sky-Walker, who was using the site's space park's rocket as his starting point in returning to his world, Starron) attacked him, and Death-Stalker opened fire on him with the deadly blasts. Death-Stalker teleported up on the alien Sky-Walker's light steps, which the alien was creating to climb back into space. Daredevil managed to disarm Death-Stalker, breaking his gun, then Death-Stalker fell into the Sky-Walker, who released an energy discharge that caused Death-Stalker to scream before vanishing. (Daredevil I#138 (fb) - BTS) - Desiring to learn the secrets behind the cobalt bomb of Paxton Page, who'd once operated as the villain Death's Head (Paxton PAge's former alias), Death-Stalker decided to pose as Death's Head in California and kidnap Paxton's daughter, Karen Page. (Ghost Rider II#13 - BTS) - Sterling placed a one million dollar bounty on Karen Page, hoping to goad some mercenary into kidnapping Page for him. The first one to respond was the Trapster, who failed his task, defeated by the Ghost Rider. (Ghost Rider II#14-15 - BTS) - The Orb attempted to collect the bounty by posing as a ghost and haunting Page, but he, too, was soon defeated by the Ghost Rider. (Daredevil I#138 (fb) - BTS) - As Death's Head, Sterling forced Stuntmaster to kidnap Karen for him and to steal various documents. He also put the powerful Smasher in his employ. (Ghost Rider II#18) - "Death's Head" collected the documents from Stuntmaster, then commanded him to retrieve Karen. (Ghost Rider II#19) - Stuntmaster brought Karen back to "Death's Head," and he demanded she give her Paxton Page's secrets. (Daredevil I#138) - "Death's Head" ordered Smasher to break into the Los Angeles Science Institute and retrieve a box from a safe, warning him that Daredevil might interfere. Having seen what "Death-Head" kill on contact those who disobeyed him, Smasher knew that he had to succeed. (Daredevil I#138) - Smasher knocked Daredevil unconscious when he interfered, then retrieved the needed box. Unsure what "Death's Head" would want him to do with Daredevil, Smasher brought him back to "Death's Head" as well; "Death's Head" was pleased with him. (Daredevil I#138 - BTS) - "Death's Head" had Daredevil placed in a pitch black room with machine guns pointing at him from all four walls, primed to start firing should he move beyond a certain point. (Daredevil I#138) - Later, when Karen Page demanded "Death's Head" tell her why he was pretending to be her father, he demanded to know her father's research into time displacement and his cobalt theorem of the fourth dimension. She tried to flee, only to find Smasher barring her exit. Unbalancing one of the machine guns and leaping to safety in the space he gained, Daredevil escaped the trap. Around the same time, Ghost Rider forced Stuntmaster to reveal why he had kidnapped Karen Page. 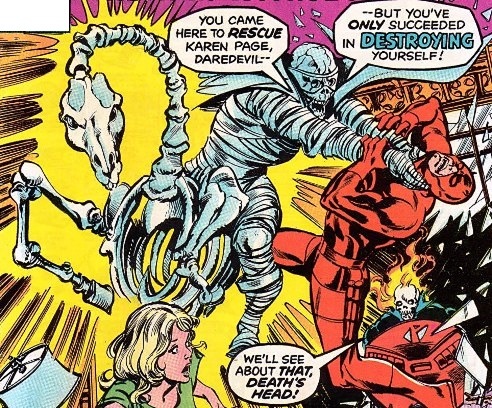 When Daredevil located Karen, "Death's Head" confronted them. Daredevil recognized his voice as Death-Stalker, but before he could speak this, "Death's Head" grabbed him, swiftly weakening him. Ghost Rider then arrived. (Ghost Rider II#20) - "Death's Head" threw Daredevil at Ghost Rider, then he phased when the hero attacked anew. "Death's Head" rode away, promising to come back for Karen later. He phased out of existence as Ghost Rider pursued him. Death's Head and Smasher soon tracked Karen down, but Daredevil attacked yet again, fighting Smasher as Death's Head unwrapped his hand to use his full powers. Daredevil tossed Smasher into "Death's Head," who -- annoyed that Smasher hadn't listened when he had announced he would end the struggle himself -- pushed Smasher away, using his death touch to kill him in the process. Death-Stalker then revealed his own identity, but became frustrated when Karen still claimed to not know anything (having gone through an FBI debriefing that apparently removed the information Paxton Page had implanted in her mind). Death-Stalker then avoided Daredevil's attack by teleporting above. When Ghost Rider attacked, Death-Stalker found him immune to his death touch. Shocked, he determined to flee. Via intangibility and teleportation, he avoided Daredevil's efforts to stop him, but Ghost Rider then hit him with a hellfire blast. Seeming to be consumed, he announced that he could not be destroyed so simply, and he presumably returned to the interdimensional void, leaving behind some burned remnants of his costume. (Daredevil I#148) - Death-Stalker tried recruiting criminals to work for him, calling a meeting on pier 16. 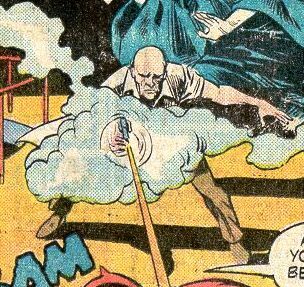 Nose Norton was coerced into revealed the meeting by Daredevil, but he then rushed to warn Death-Stalker just as Daredevil attacked, fighting off several men, including Sammy. Sammy fell into Death-Stalker's hand and was killed, causing the other men to flee. Daredevil knocked a pile of crates on Death-Stalker, who simply teleported away, promising Daredevil would pay for ruining his plans. (Daredevil I#149 (fb) - BTS) - Seeking vengeance on Daredevil but lacking the time to hunt him down himself, Death-Stalker empowered a new Smasher and sent him to kill Daredevil. (Daredevil I#149 - BTS) - The Smasher twice failed to complete his task. Daredevil tried to convince the Smasher to get as far away from Death-Stalker as possible, because Death-Stalker would kill him as soon as he no longer had any need for me. Daredevil eventually trapped Smasher under a dumpster, then told the police not to arrest the unconscious Smasher, because Death-Stalker would kill him in prison. (Daredevil I#152) - Having long awaited completion of a component he desperately required, Death-Stalker appeared within Los Angeles' Stark International branch (Stark West), killing a technician and stealing the component. He noted that while he could not afford to be patient as the end was growing nearer with every passing second, soon he would have everything he needed to make Daredevil pay for what he had done to him. (Daredevil & Captain America: Dead on Arrival#1 (fb) - BTS) - In an attempt to solidify himself in one dimension, Sterling experimented with an interdimensional engine, but instead found himself transported to the future, where he learned he'd been killed in a battle with Daredevil. Furious, he went to his mother's home and found she'd been dead for years. Sterling killed the caretaker there to appease himself. He read his mother's notes and learned of her plans to avenge him against Daredevil. Rushing out to the streets, Sterling discovered Daredevil was still alive and he vowed revenge. After inventing a spray that caused maddening hallucinations, Death-Stalker began killing citizens at random, including Jeff Washington, Lester Niven, Jack and Mira Hokler, Jim Hernandez, Paul Radek, and Gertie Stein. He took several others captive and tied them up in the cemetery where his body was buried. Meanwhile, after Sterling's death in the past (which was his future), SHIELD took his cybernetic gloves and studied them. Years later, the gloves showed signs of activity again, and SHIELD surmised that Sterling must still be alive and controlling them mentally. Simultaneously, SHIELD equipment noted someone or something stepping through the barriers of time and into the present. When people started turning up dead, seemingly by a death touch, they wondered if Sterling was alive, and they predicted he'd traveled to the present before his death in the past. (Daredevil & Captain America: Dead on Arrival#1) - Nick Fury called in Captain America to try and track Death-Stalker through the symbiotic link in the cybernetic gloves. Fury explained that Sterling would need to be captured alive so that he could return to the past for his proper death (the whole time paradox that doesn't exist in a multiverse scenario). 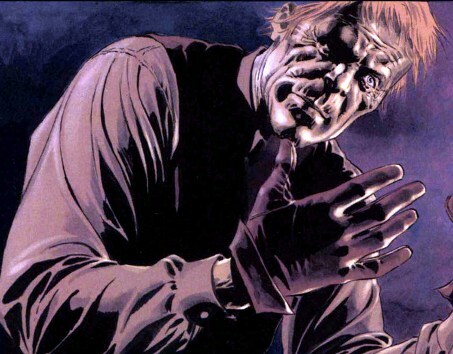 Meanwhile, Sterling killed Mr. Nolan, took his son Sean captive, and sent his wife Angie to lure Daredevil, who'd already been investigating the mysterious deaths in the city, into the trap. Sterling killed one of his captives who tried to escape. Daredevil arrived as Sterling was taunting Sean, and Sterling easily phased through the hero's first attack. When Sterling solidified to deliver a death touch, Daredevil managed to hit him twice. When Daredevil leaned in close, Sterling hit him with the madness (hallucination and panic-causing)-spray, causing Daredevil to panic at the sights around him. Sterling leaned in with his death-touch, but Daredevil managed to leap over him and kick him to the ground. Still hallucinating, Daredevil punched Sterling repeatedly, intent on killing him, until Captain America arrived to stop him. Daredevil attacked his ally and they savagely battled until Cap gave him Stelazine, an anti-psychotic drug of the phenothiazine class, that returned Daredevil to normal. Furious, Sterling moved in toward Sean Nolan and promised to kill him unless Daredevil sacrificed himself. 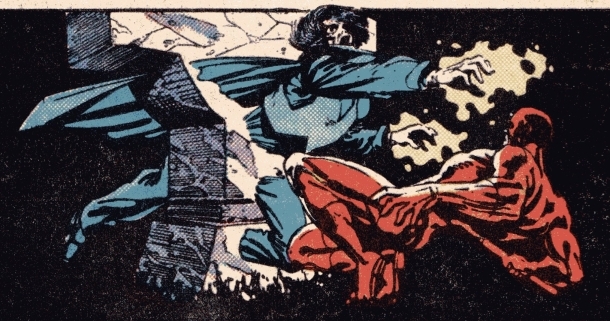 Sterling reached his hand toward Daredevil, who jumped just in time to let Cap's shield hit Death-Stalker in the face. 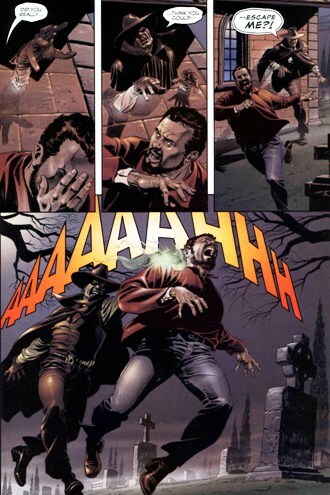 Hearing Cap's theory that Sterling's death would cause a time paradox, Sterling turned his gloves on himself and administered the death-touch as his final revenge, but he was instead sent back into the past, where he awakened with no memory of what had happened to him on his future adventure. (Dr. Strange II#29 (fb) - BTS) - Hearing of a New Jersey research lab (one that Kyle Richmond had controlling interest in)'s work on a new star-drive, Sterling sought to obtain a new deadly weapon. He began terrorizing employee Dr. Thatcher (posing as a demonic entity), scaring Thatcher into giving him the pieces the proton converter. When Thatcher crossed him, Sterling killed him with a touch. Sterling then disguised himself as the ghost of Thatcher to continue terrorizing his assistant H. Howard Bradley. (Dr. Strange II#29) - Sterling frightened Bradley into giving him the spatial disruptor, and prepared to make the ultimate weapon by linking it to the proton converter, but Nighthawk and Dr. Strange attacked. 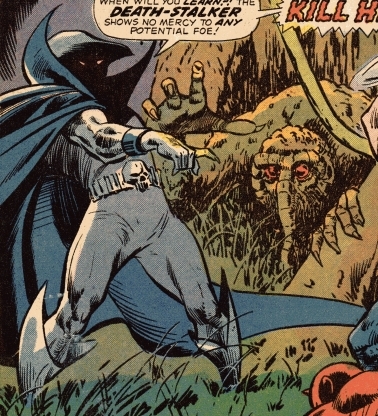 Strange immediately dispelled Death-Stalker's disguise as Nighthawk flew at him; Death-Stalker left Night-Stalker unconscious, but chose not to kill him, claiming he wasn't in the mood. He grabbed the proton converter, but Strange blocked him from getting the spatial disruptor. When Strange redirected an energy blast, Death-Stalker jumped through the hole in the wall to escape, but Strange pursued him. Sterling touched Strange, who released his astral form in time to survive, though his body appeared to die. When Sterling saw Strange's astral form, Strange claimed to be his own ghost; though suspecting a trick, Death-Stalker was nonetheless unnerved. Sterling fired on the ghost and threw several items at it, panicking, and then he prepared to kill Nighthawk with a final shot. When Strange turned the shot back on him, the proton converter exploded, and the heroes assumed Death-Stalker was dead. (Daredevil I#155 - BTS) - As he shadowed his hated foe, Sterling discovered Daredevil was really Matt Murdock. (Daredevil I#155) - Death-Stalker secretly watched from amidst a pile of garbage while a concussed Daredevil changed into Matt Murdock. After Murdock departed, Death-Stalker announced that soon Murdock would pay for his years of torment and suffering his soul-withering touch. (Daredevil I#156) - Death-Stalker found Daredevil at his hospital bed (sleeping after reviving from a coma brought on by a severe concussion) and prepared to kill him with his death touch. (Daredevil I#157) - Having been waiting outside during Daredevil's recovery and summoned by a nurse when Daredevil briefly revived from a delirious state, the Avengers (Beast, Black Widow, Captain America, and Hercules) rushed into the room, distracting Death-Stalker from Daredevil. Reviving, Daredevil stopped Beast from leaping into Death-Stalker's grip. Death-Stalker phased through Black Widow's sting, then teleported away, promising to return for Daredevil. (Daredevil I#158 (fb) - BTS) - Death-Stalker approached three men and offered them the powerful Ape-Man, Bird-Man, and Cat-Man costumes. He christened them the Unholy Three, after his old team, and offered them one hundred thousand dollars to kidnap blind attorney Matt Murdock (not bothering to tell them Murdock was Daredevil). (Daredevil I#157 - BTS) - Cat-Man watched Daredevil from afar, escaping his notice. Bird-Man watched from outside a window as Murdock amorously embraced Heather Glenn. Ape-Man, Bird-Man, and Cat-Man subsequently attacked the office of Matt Murdock to kidnap him. Black Widow, Becky Blake, Foggy Nelson, and Heather Glenn were. Black Widow punched Cat-Man, but Bird-Man punched her from behind and knocked her down. When Foggy hit Ape-Man with a chair, Ape-Man struck back, hurting Foggy. (Daredevil I#158 - BTS) - With Murdock unable to fight back (both to avoid revealing his identity as Daredevil and due to the cramped, crowded space), Bird-Man and Ape-Man tied him up. The Unholy Three then took him through the window after Ape-Man punched the Black Widow back again. They left through the window, but Bird-Man was hit in the head by a nameplate tossed by Heather Glenn. Black Widow leapt on his back and shredded his wings. He crashed to the ground and was later arrested. Ape-Man and Cat-Man brought Murdock to their destination, and en route they revealed they were working for Death-Stalker. Arriving at St. Stephen's Cemetery, they bound Murdock to a tombstone, ignoring him as he tried to warn them that Death-Stalker would kill them when he no longer had use for them. (Daredevil I#158) - Death-Stalker met Ape-Man and Cat-Man (Bird-Man had been captured) at the cemetery, where he'd prepared a grave for Murdock. He explained his origins, then turned away from Murdock, deliberately giving him more time to free himself from his bonds as he killed Ape-Man and Cat-Man with a touch. Death-Stalker waited just outside reality while Murdock clothed himself as Daredevil, then fully entered Earth's dimension again and attacked. Daredevil lashed out, while Death-Stalker continually faded away and returned unexpectedly. At one point, Daredevil was knocked into his grave and nearly killed with a thrown shovel. Soon, Daredevil knocked out the streetlight with his Billy Club, plunging them into darkness and evening the odds somewhat. Thrown by the darkness, Death-Stalker panicked and lunged at Daredevil repeatedly, but as he was maintaining himself in the Earthly plane, Daredevil could hear him and sense his crackling gloves. Daredevil tricked him into lunging for a statue, then smashed his hands and then knocked him through the air with his Billy Club. Partially phasing out of reality, Death-Stalker landed passed partway through a tombstone. 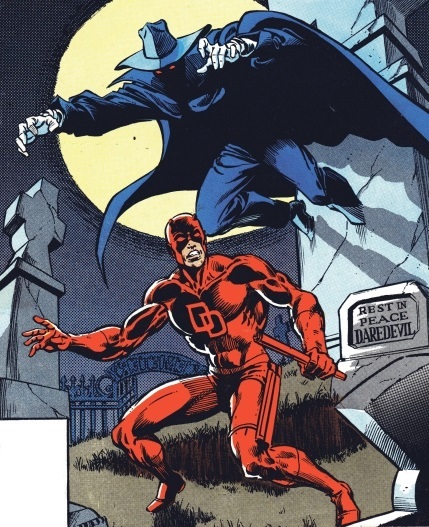 As Daredevil approached and told him to surrender, the maddened Death-Stalker phased back into reality, hoping to kill Daredevil with his death grip but instead died as he solidified with the tombstone sticking halfway though his body. (Daredevil & Captain America: Dead on Arrival#1) - After Sterling's death, SHIELD took his cybernetic gloves and studied them. They found that the device's death touch didn't work with any other wielder, presumably indicating something unique to Sterling's T-radiation impregnated form, or perhaps b/c they were designed specifically for him alone. (Daredevil I#208 (fb) - BTS) - Upon Death-Stalker's death, his mother (now the last in the Sterling line) used much of her fortune ("more than many small nations expend annually") to convert their ancestral home in Riverdale, the Bronx, New York City, New York into a machine, an immense death-trap with the sole purpose of killing Daredevil to avenge her son's death. (Daredevil I#208 (fb) - BTS) - Upon Elizabeth Dawes Sterling's death, the death-trap activated. (Daredevil I#208 - BTS) - A few days later, one of the death-trap's robotic young girls led Daredevil into the death-trap, but he narrowly escaped and survived it. (Daredevil I#209 (fb) - BTS) - More of the girls staked out Daredevil and Murdock's usual hangouts, but he escaped each of them and led them back to the mansion's remains, which destroyed it and the robots; Murdock's childhood friend Johnny Squarejohn sacrificed himself saving Daredevil from one of the last exploding girls. Comments: Exterminator created by Stan Lee, Gene Colan, and George Tuska. 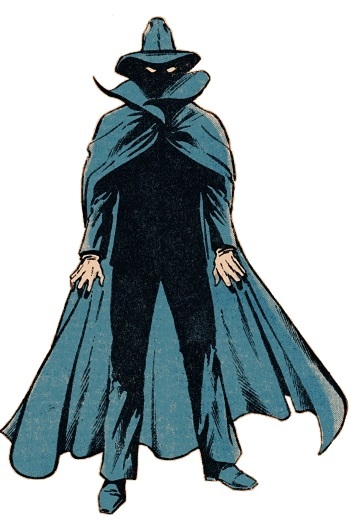 Death-Stalker created by Steve Gerber, (design) Anthony Pezella, (costume design) Josef Rubinstein, (depicted in print) Bob Brown and Vince Colletta, (fleshed out) Marv Wolfman and Roger MacKenzie. 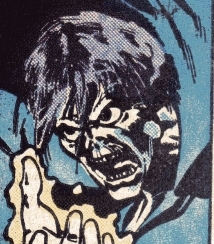 Death-Stalker received entries in the original Official Handbook of the Marvel Universe I#13, in the Deluxe Edition I#16, and in the Master Edition. Phillip Wallace Sterling worked as the Organizer's assistant in Daredevil I#10, although he wasn't actually ever seen in that particular issue, but it was because of his connection to the Organizer that Sterling thought to use the Ani-Men/Unholy Three, the Organizer's top cronies, for his own nefarious plans. Bob Almond informed us that George Olshevsky' Daredevil Index (Marvel Comics Index#9B) included letters page info from Daredevil I#113 that had informed the readers that Death-Stalker had been created by Anthony Pezella and Steve Gerber. Additional info from Daredevil I#161's letter page added Josef Rubinstein as Death-Stalker's costume designer. It was Marv Wolfman, not the Death-Stalker's original creator the late Steve Gerber, who decided to make it turn out that the Death-Stalker was actually old DD foe the Exterminator in disguise. 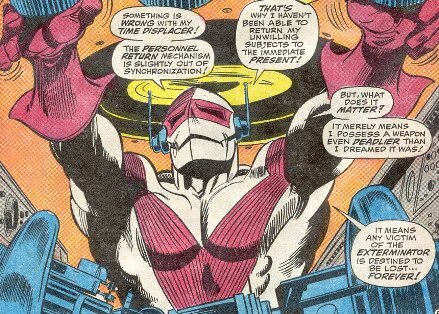 The first sign of this plot move happened in Daredevil I#138 where the Death-Stalker (while posing as Death's Head) first mentioned his need to seek out information regarding time displacement, something akin to the Exterminator. Wolfman also wrote the Death-Stalker's origin pages in Daredevil I#158, although Roger MacKenzie had scripted the rest of the story. Who knows what Gerber had in mind when he created the Death-Stalker, but he always created crazy, spooky, and mysterious foes, and he likely intended to give Daredevil a more interesting, supernatural-style foe. Thanks to Per Degaton for adding several missed issues and Jean-Marc Lofficier and Per Degaton for pointing out the missed Dr. Strange II#29 appearance. (Daredevil I#115) - Death-Stalker took chemist Milo to a closed down Osborn plant to try and recreate the formula in the papers. When Daredevil attacked, Milo opened fire before being subdued. Daredevil realized that Death-Stalker couldn't use his death-touch and phase at the same time as Death-Stalker tried knocking the hero into a vat of acid. They fought across the plant until Death-Stalker fell into the vat, seemingly being killed. Daredevil then destroyed the Sallis Papers and apprehended Milo. (Daredevil I#128) - Seeking to rebuild an ancient lens ray designed by the ancient Atlantean wizard C'Thunda, Death-Stalker snuck into the science pavilion at Flushing Park in order to steal supplies. He killed one guard, Jackson, and knocked out another, then worked to get mirrors off of statues in various rooms. (Daredevil I#148) - Death-Stalker tried recruiting criminals to work for him, calling a meeting on pier 16. 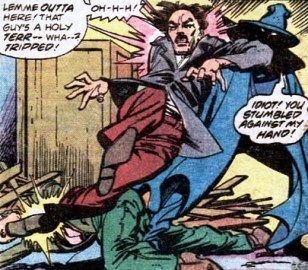 Daredevil attacked, fighting off several men, including Sammy. Sammy fell into Death-Stalker's hand and was killed, causing the other men to flee. (Daredevil & Captain America: Dead on Arrival#1 (fb) - BTS) - After inventing a spray that caused maddening hallucinations, Death-Stalker began killing citizens at random, including Jeff Washington, Lester Niven, Jack and Mira Hokler, Jim Hernandez, Paul Radek, and Gertie Stein. He took several others captive and tied them up in the cemetery where his body was buried. (Daredevil & Captain America: Dead on Arrival#1) - Death-Stalker killed Mr. Nolan, took his son Sean captive, and sent his wife Angie to lure Daredevil, who'd already been investigating the mysterious deaths in the city, into the trap. Daredevil and Captain America arrived as Death-Stalker was taunting Sean, and they fought the villain in a savage fight. Furious, Death-Stalker moved in toward Sean Nolan and promised to kill him unless Daredevil sacrificed himself. Death-Stalker reached his hand toward Daredevil, who jumped just in time to let Cap's shield hit Death-Stalker in the face. Sean was soon freed.